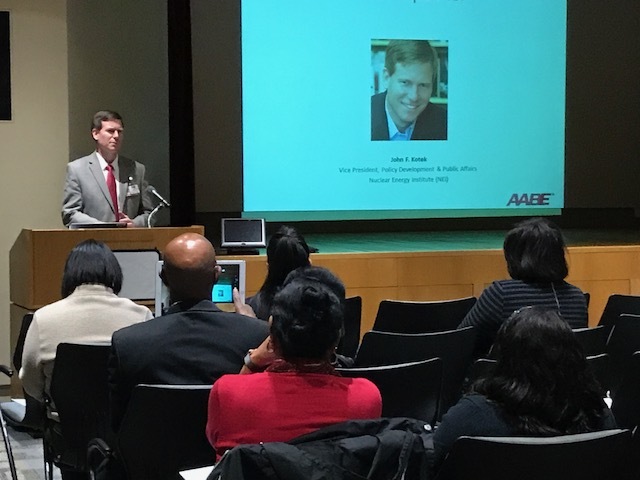 On November 7th, Mr. John F. Kotek, Vice President for Policy Development and Public Affairs of the Nuclear Energy Institute (NEI), provided an overview of the energy industry from a NEI perspective. Mr. Kotek’s current responsibilities include providing policy and public affairs leadership on financial, economic, tax, electricity market, and environmental issues related to the nuclear energy industry. Held at Dominion’s One James River Plaza (OJRP), Mr. Kotek discussed howNEI is working to meet the challenges facing the nuclear industry in a four-point strategy to preserve, sustain, deploy, and thrive: To preserve, they are working to get nuclear better compensated for the attributes it brings to the electricity market. To sustain, NEI is working with regulators like those a the Nuclear Regulatory Commission to ensure that the policies that are put in place make sense and are focused on risk reduction and don’t add regulatory burdens. To deploy, they are ensuring new builds, whether its completion of those already under construction or the development of those already under construction of the development of small modular or advanced reactors that can serve in the next wave of nuclear build in the U.S. and abroad. To thrive, NEI is working internationally where it is expected that the largest market for nuclear is overseas. Through these efforts NEI is working through the continuum of keeping the current plants in operation, working with regulators to keeping them running longer term, and deploying advanced technologies.